Let’s unplug from technology and plug into nature! This picture was absolutely perfect for me to see on my vacation. It was very synchronistic since I had decided to take my technology break as well. What amazed me the most was the number of people who were not taking in all the incredible nature that was surrounding them, and instead were on their cell phones. One couple in particular totally amazed me. At dinner, they were not talking but instead texting on their cell phones. At night by the outdoor bar, instead of enjoying the light of the moon, their faces were lit up by the light of their cell phones. One day when we were going to breakfast, the lady just about bumped into me because she was so busy texting on her cell phone. 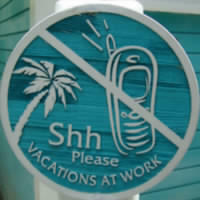 Why go on vacation if you are that attached to your cell phone? Why not just “be” and live in the present and soak up the incredible sights and sounds around you? Don’t get me wrong, technology definitely has its place, but I believe that everything should be in moderation….and I feel that technology has tipped the scales towards an unhealthy balance for many. A recent study done by the National Wildlife Federation indicated that “the average school-aged kid spends almost eight hours a day indoors in front of electronic media, sedentary.” This to me is a scary statistic as back in 2009, the average was only 6 hours per day. How disconnected are we going to become as adults and as children? What do we want to model to children? What are your feelings and thoughts on this topic? Please share.